In order to pass information to the instantiated VM template, the Context section of the vOneCloud VM Template can be used. These templates can be updated in the Virtual Resources -> Templates tab of the vOneCloud GUI, and they can be updated regardless if they are directly imported from vCenter or created through the vOneCloud Templates tab. Installing the Contextualization packages in the Virtual Machine image is required to pass this information to the instantiated VM template. Make sure you follow the Guest Contextualization guide to properly prepare your VM templates. vOneCloud does not rely on a DHCP server to configure networking in the Virtual Machines. To do this configuration it injects the network information in the contextualization section. This is done checking the “Add Network configuration” check box. When vOneCloud finds this option it adds the IP information for each of the network interfaces configured plus extra information that resides in the Virtual Network template, like DNS, gateway and network mask. The parameters used from the Virtual Network template are explained in the OpenNebula documentation, Managing Virtual Networks section. One of the other very important things you have to configure is user credentials to connect to the newly created Virtual Machine. For Linux base images we recommend to use SSH public key authentication and using it with vOneCloud is very convenient. 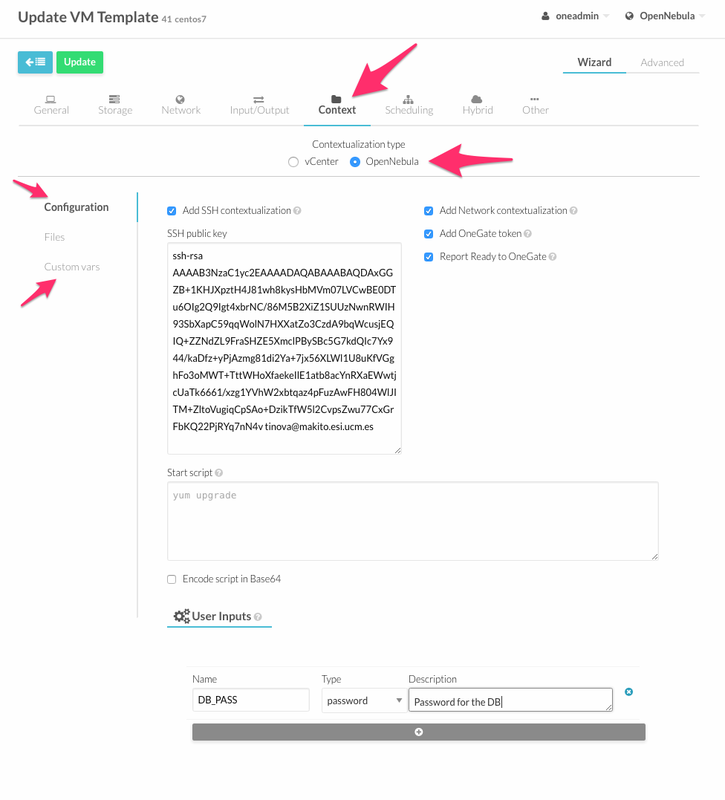 The first thing the users should do its to add their SSH public key (or keys) to its vOneCloud user configuration, this can be done in the Settings section of the web interface. The Context section of the VM Template needs to have the “Add SSH contextualization” check box selected. Using this system the new Virtual Machines will be configured with the SSH public key of the user that instantiated it. For Windows machines SSH is not available but you can use the options USERNAME and PASSWORD to create and set the password of an initial administrator, they can be set as Custom Vars. To be able to execute commands on boot, for example, to install some software, you can use the option Start script text area. When this option is used a new file that contains the value of the option will be created and executed. For Windows machines this is a PowerShell script. For Linux machines this can be any scripting language as long as it is installed in the base image and the proper shebang line is set (shell scripts don’t need shebang). In this example some commands will be executed using bash shell that will install the package ntpdate and set the time. If you are using complex scripts, it is a good idea to use the “encode script in Base64” option. These inputs are a special kind of contextualization that built into the templates. At instantiation time, the end user will be asked to fill in information for the defined inputs, and the answers will be packed and passed onto the VM. These are personalized information to pass directly to the VM, in the form of Key - Value.